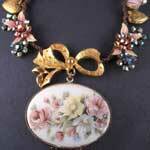 Memorial jewellery, vintage jewellery handmade in London. If you have lost someone dear to you and would like to commission some remembrance / memorial jewellery incorporating special momentos belonging to that person, either for yourself , or as a special gift for someone else, please contact us to discuss this. As each precious life is personal to the one who lived it, every necklaces tells it's own unique story. If you would like to read more about how this works in practice, you can read about Darcie's necklace on my testimonial page. Darcie is a six year old girl who recently lost her mother to cancer. Her mothers friends in France commissioned a necklace, via email, as something for Darcie to remember her mother by.